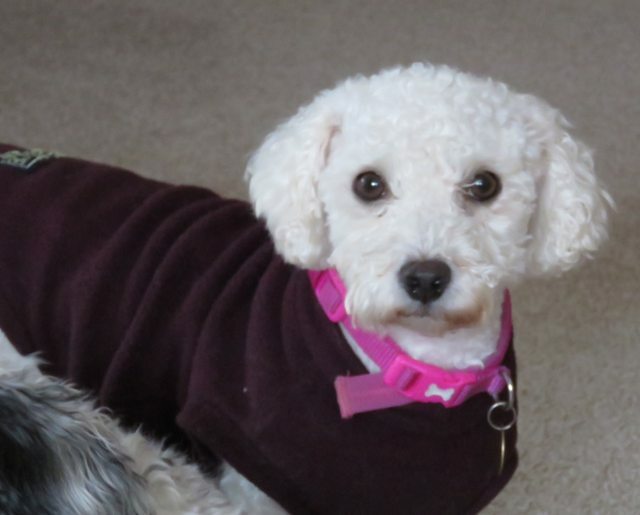 Poppy is a 4 year old female Bichon Frise. Poppy is a delightful little girl who has certainly come a long way in the couple of months since leaving the bad memories of her breeding life behind her. Poppy is in good health and is a smart dog that enjoys being one of the gang. Whilst she is reliably house trained, prospective new owners should be aware that there may be one or two accidents following rehoming due to anxiety or uncertainty. In terms of food, Poppy eats well and enjoys just about anything you give her. She will also try and drink your cup of tea given the chance. She sleeps well at night and loves to snuggle up with the other dogs in the foster’s home, who have all helped show her the ropes in her new life. In order for this to continue and to provide the support that she needs, Poppy needs to be re-homed with at least one other gentle outgoing resident dog. For her, the more the merrier as she is happiest when in the company of other dogs. Poppy gets on famously with dogs of all shapes and sizes and there are no issues when she meets and greets other dogs when out for walks. 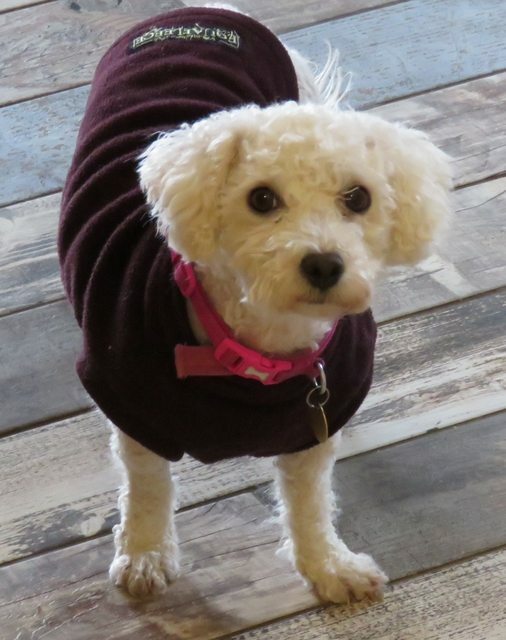 Poppy can walk for miles and is a really robust and hardy little walker. She behaves impeccably on the lead. Whilst she has come such a long way, she still has fear issues around men. We can only guess at the origins of this. It would therefore be beneficial if she was re-homed where a female is the main care provider. Poppy will overcome her fear of men to a further extent given time and patience, but there is a chance that she may not bond with men and this is something that prospective adopters will need to consider. Poppy is not a barker unless someone higher up the pecking order is barking in which case she may join in. The only time she barks is when startled by a male presence and she is not persistent. 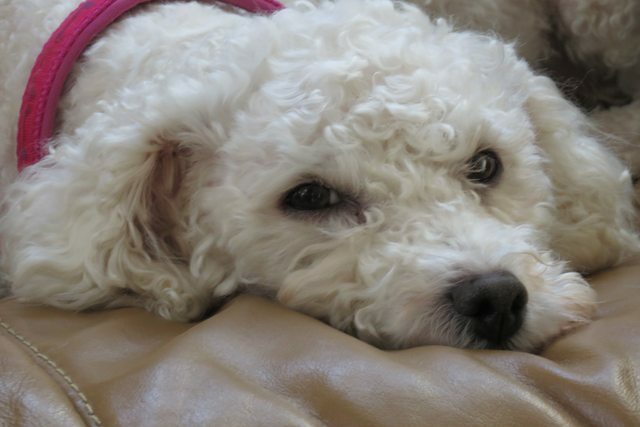 Anyone considering the adoption of a Bichon should be aware that as the dog coat continually grows, dog grooming every 6 weeks is a must. The good news is that Bichons don’t moult. Her ideal home will be somewhere quiet where she can continue to progress in a relaxed environment in the company of other dogs. She needs an owner/owners who are around most of the time and can work with her to rebuild a proper dog’s life. She could be homed with older teenagers who understand her fears, but no small children as they would be too much for her. 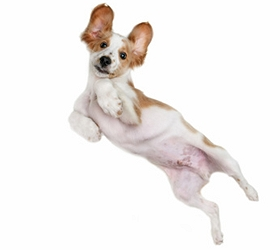 You will need to be patient and either have direct experience of rehoming this type of dog or be aware of the fact that progress will take a while to make her adjustments fully. Poppy does not suffer from separation anxiety and so can be left for short periods. She is a lovely sweet girl who is emerging into her own character. 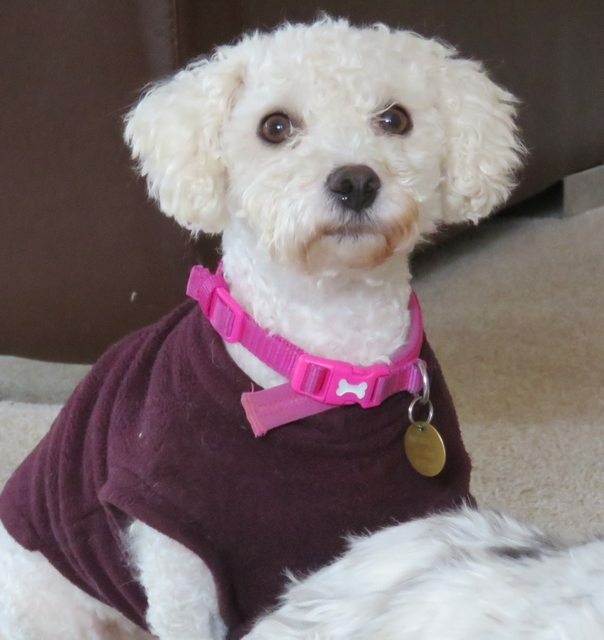 Poppy is being fostered near Hastings in East Sussex and has been neutered, vaccinated, flea and from treated and microchipped.